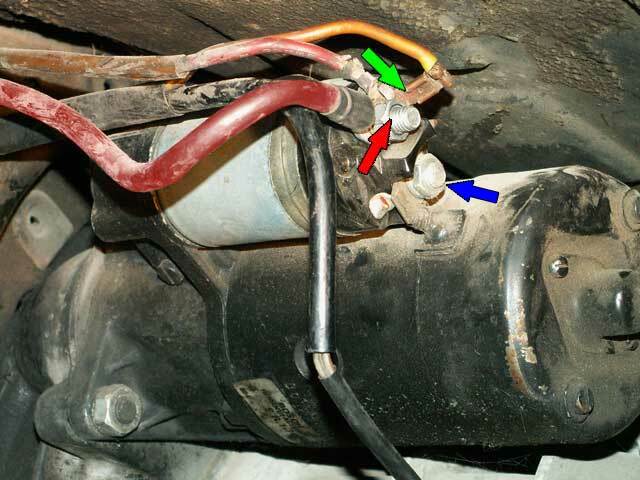 In the photo below, the red arrow points to the main power terminal at the starter (which comes straight from the battery). You mentioned "no power to starter", but you should have 12v there. Maybe you mean the starter is just not cranking? The green arrow points to the solenoid terminal which comes from the starter switch. As SGB said, you could try shorting those and see if it cranks (obviously be careful - make sure it's in neutral). Let us know... more info will help us solve this. Last edited by RandyLok; 09-22-2005 at 08:26 PM..